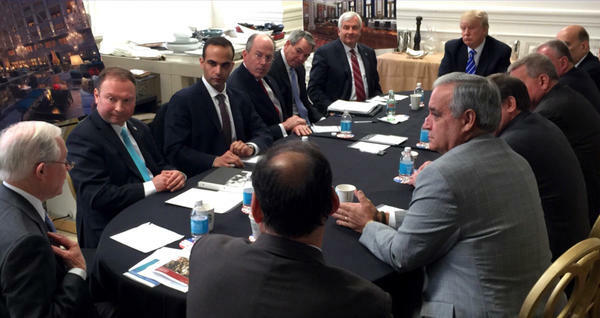 A photo posted in March, 2016 on President Donald Trump's Twitter account shows George Papadopoulos, third from left, at a national security meeting with then-candidate Donald Trump. The President told reporters on Friday morning that "I don't remember much" about the controversial meeting. Updated on Nov. 3 at 11:04 a.m. E.D.T. President Donald Trump said "I don't remember much" about a March 2016 meeting at which a foreign policy adviser proposed setting up a meeting between then-candidate Trump and Russian President Vladimir Putin. "It was a very unimportant meeting, took place a long time ago," Trump told reporters at the White House before he boarded a helicopter for his trip to Asia. That March 31, 2016, meeting of Trump's campaign team has taken on new importance this week after prosecutors disclosed that a young adviser at the table had pleaded guilty to making false statements about the nature of his contacts with Russians last year. That former adviser, George Papadopoulos, has agreed to cooperate with investigators working for Justice Department special counsel Robert Mueller. Also at the table in March 2016 was now-Attorney General Jeff Sessions. At his confirmation hearing this year, Sessions denied having contacts with Russians during the campaign. Senate Democrats including Al Franken of Minnesota, Patrick Leahy of Vermont and Richard Blumenthal of Connecticut have accused Sessions of lying under oath. On Thursday, the Democrats demanded that Sessions return to the Senate to answer new questions about his contacts as a top surrogate for Trump, and contradictions in his testimony this year. Leahy said Sessions' prior accounts are "impossible to reconcile" with court papers unsealed this week. But Republicans, who control the Senate and the Judiciary Committee, probably have little appetite to grill the attorney general of their own political party. Chairman Chuck Grassley, R-Iowa, has not scheduled any new hearing. The criticism of Sessions is taking place at a sensitive time for the attorney general: Trump has spent the last day using Twitter and impromptu media sessions to beat up on the legal arm of his own administration. "I"m really not involved with the Justice Department," he said on Friday morning. "I'd like to let it run itself. But honestly, they should be looking at the Democrats ... A lot of people are disappointed in the Justice Department including me." Trump also has tweeted that he wants the DOJ and the FBI to launch an investigation into his political opponent, Hillary Clinton. He has criticized James Comey, the FBI director he fired in May under questionable circumstances. And he urged prosecutors to take a look at Anthony Podesta, a prominent Democratic lobbyist who stepped aside from his firm, The Podesta Group, earlier this week after court documents suggested Mueller's office was investigating his work on behalf of Ukraine. Another onetime Trump campaign leader connected to the Papadopoulos guilty plea is Sam Clovis, who denied wrongdoing but announced he would withdraw from a position at the Department of Agriculture in advance of his November 9 confirmation hearing. The public remarks from the commander in chief break with decades-old traditions dating back to the post-Watergate period, when officials from both political parties demanded the Justice Department be insulated from political pressure from the White House. "This isn't a partisan issue," said Matthew Axelrod, who served in the Justice Department under Democratic and Republican presidents and now works at the firm Linklaters. "Everyone who cares about the institution should be up in arms." On Thursday, Trump told an interviewer at WMAL radio in Washington that he was "very frustrated" by constraints on his ability to influence the federal law enforcement process. "But you know, the saddest thing is that, because I'm the president of the United States, I am not supposed to be involved with the Justice Department," Trump said. "I'm not supposed to be involved with the FBI. I'm not supposed to be doing the kind of things that I would love to be doing." Nonetheless, Trump has continued to decry the ongoing special counsel probe as a "witch hunt," even as Mueller's team took first public actions this week. On Friday morning, Trump told reporters, "All I can tell you is this: there was no collusion, there was no nothing. It's a disgrace, frankly, that they continue." The pattern of public statements from the president, who also called for the execution of a suspect accused in the New York City truck attack this week, does not surprise critics of his administration. Last year, even before the election, legal analysts and Justice Department veterans warned that Trump might have little respect for the department's traditions. But Deputy Attorney General Rod Rosenstein this week used a lecture at the federal courthouse in Washington --the same building where Trump's former campaign chairman Paul Manafort pleaded not guilty to conspiracy charges — to hail the president's respect for the rule of law. In responding to audience questions, Rosenstein highlighted a case against the former police chief in Bordentown Township, New Jersey. The retired chief, Frank Nucera Jr., is accused of violating the civil rights of a black civilian, including slamming the person's head into a metal door jamb and causing a "loud thud." Rosenstein described the prosecution as evidence of the Justice Department's commitment to prosecuting law-breaking by police. Left unmentioned, however, was Trump's July speech in New York at which he told law enforcement officials not to go easy on suspects when they are arrested. "Please don't be too nice," the president said.